Director. Philippe Van Leeuw, Written by Philippe Van Leeuw. Cast. Hiam Abbass as Oum Yazan (no birth name), Diamand Bou Abboud as Halima, Juliette Navis as Delhani, Mohsen Abbas as Abou Monzer, Moustapha Al Kar as Samir, Alissar Kaghadou as Yara, Ninar Halabi as Aliya, Mohammad Jihad as Sleik Yazan, Elias Khatter as Karim, Husam Chadat as Man 1. Music by Jean-Luc Fafchamps. Cinematography by Virginie Surdej. Film Editing by Gladys Joujou. 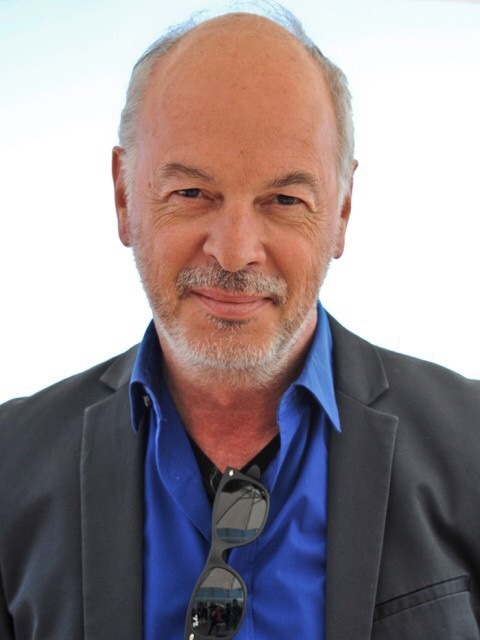 First Assistant Director, Jean-François Ravagnan. Producers: Guillaume Malandrin, Serge Zeitoun. Co-producers: Tomas Leyers, Pierre Sarraf. Duration 1hr 25mins. Country, Belgium. Language, Arabic. English subtitles. Certificate 18. 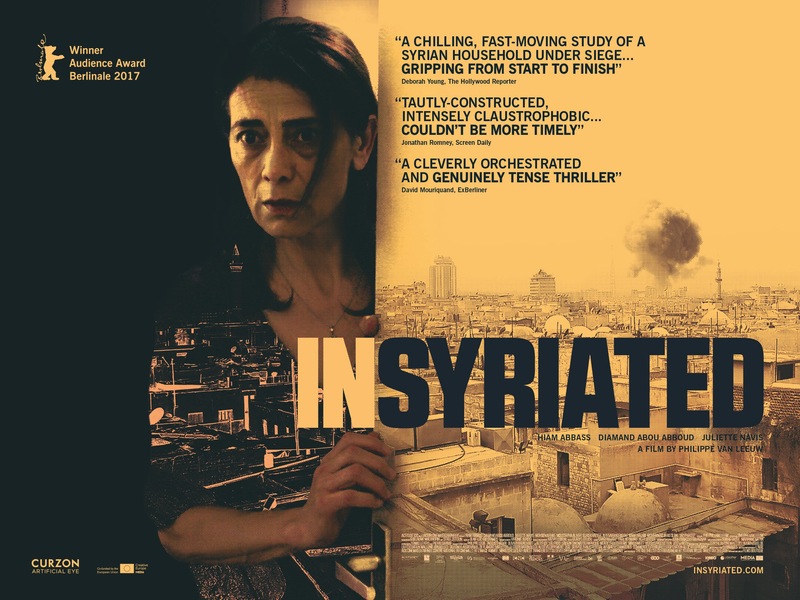 This is a social political drama which claustrophobically is set in an apartment building, in the war torn Syrian capital Damascus, surrounded with the sounds of war. Occupying the fourth floor of the building is matriarch Oum Yazan played superbly by Hiam Abbass, a very well known Israeli/Palestinian actress whose films include Lemon Tree (2008) Amreeka (2009) The Visitor (2008) and Inheritance (2012). She is despite the war danger all around her, is not for moving. Having found a home it is unconscionable she should give up what has become her family life. Heading the cast she and Juliette Navis and Diamand Bou Abboud are joined by the remainder of the cast, real Syrian refugees who’d never acted before so all the child are on a formidable journey in many different ways. Cinematographer turned director Phillipe Van Leeuw deals – again, with a stark war situation having previously delivered an equally horrific film; that is a warning already, set in the Rwanda genocide – The Day God Went Away. Like this film it concerns itself with the humanity. He avoids the politics and us and them scenarios but deals with the war’s impact and people’s mobility, immobility. This is filmed in Lebanon. Undoubtedly it is a difficult watch. Unforgiving in its telling and though slightly overdoes it on occasion, it never underestimates the dreadful negative power of violence underpinning not just individuals but nations. His use of a hand held camera is a very effective tool in the confines of the apartment and it pulls you in almost as an involuntary observer. To the sounds continuing outside, rapid fire machine guns, sniper fire, overhead missiles flight, bombings, sirens, explosions, you react and every tension is felt. Never are the politics of a domestic civil war and proxy international war any part of the message except the axiomatic one of wars never having solutions with these stories part of the telling. For a film to confine itself to the interior world of an apartment it immediate sets up the people within it to interact, by each revealing increment, individual nuances of the characters own place in this Damascus oppressive and stifling setting. Every character is neatly framed in their willingness or stoicism acceptance of this strange and rapidly altering unstable place. The children too exhibit fear and confusion of what it means as a part of their lives. All compartmentise their lives within this space. Seemingly assured and on the other hand, equally concealing her terror, matriarch Oum Yazan takes the audience into the screen. Each movement becomes, in the hand held direction of the camera, something tangible and present. We enter the bedroom to be introduced to a sleeping Samir played by Moustapha Al Kar, with crouched leaning back against the bed a softly reflective Halima whose face is like a Botticelli. 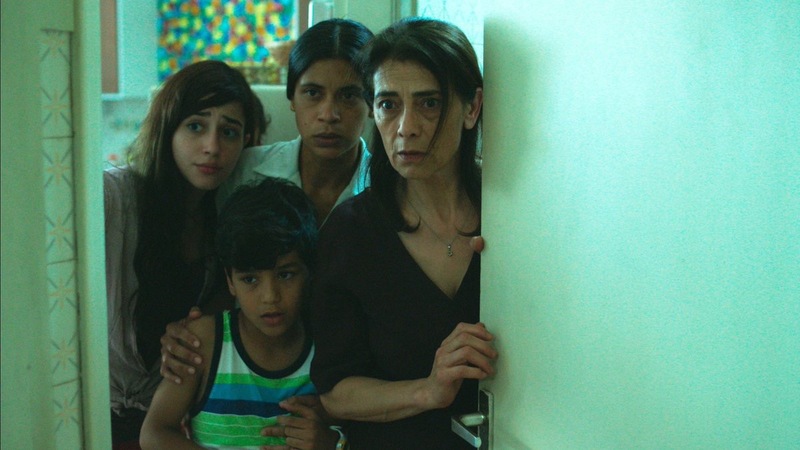 Played by Beirut born Diamand Abou Abboud, with Void (2013) Stable Unstable (2013) and Doukhan bila nar (2008) on her roster as well as being a writer, she is a mother with turmoil ravaging her thoughts. The family Samir, Halima and baby son have flight on their minds. Her expressions draw you into the tragedy of the situation and her part is pivotal with a life changing act following on from another hidden horror. This sense of insular tense insecurity grows as the fellow occupants of the apartment join the story. Oum’s daughters Yara (Alissar Kaghadou) and Aliya (Ninar Halabi), a son Yazan (Mohammad Jihad Sleik), her father-in-law Mustafa (Mohsen Abbas), and their maid Delhani (Juliette Navis). Then there is the family mentioned above, Halima (Diamand Abou Abboud), Selim (Moustapha Al Kar), and their newborn child who have come down from a floor above and Yara’s boyfriend, Kareem (Elias Khatter), child after child is introduced. The children being non-actors perform extraordinarily and it occurs to you that this is the common currency of their lives, being Refugees now in Jordan. Then the cast absorbs you completely with their story. This film, as reviewer MK has already quickly noticed, bears a similarity to one of my favourite films of the recent year gone, Under the Shadow. Both are set in an interior World. There is horror in both. There is a common deception and an inability to deal with issues among people and the terror is not held back by withholding truth. People deceive even when they are relied on to be honest. Coming to dilemma early on, Oum Yazan is confronted with choice and it is a real one with her being told something witnessed by the maid Dalhani. I think it is a valid choice given the regard for their safety and time needed to take in the enormity of the incident. Some others record it differently. Their choice and both valid as neither of us will have had that choice to make. The burden of knowing is torturous and the tension is felt unbearable within the film. The humanitarian dilemma faced in the place, the apartment building all would call their home, begins to loose its sense of permanence and stable routine has now vanished on the will of others which imperils this group with fate no longer determined by them but by the external and the fragility of living in a war torn conflict zone. World power struggles are on their street and huge resources of phenomenal destructive war weaponry is the reality just outside their walls. Even weaponry which is banned from conflict use is in being deployed. The bare rule making and war baiting has no longer any place or role. Outside their home, in its streets, it is incandescent with fury and the complete failure of mankind to reconcile or recoil from violent means of governance. Liberty, equalitarianism is nowhere to be found. When the rooms were the film takes place within one day, are seen they too tell a story. Syrian, Arabic decor is never primary in flour and this is part of the design in this film. It puts across colour as intensity removed. Blues, Yellows, Greens, Reds, each soulfully reflective of nature. There are the washed walls which are lightly colour and not dark heavy boundaries. The curtains too are exquisitely patterned in Arabic sometimes modernist interpretations of ancient patterns. In the old kitchen the tall tiled splash back wall tiles are circles and swirls as in micro form natures patterns disclose under the micro scope. This is the home Oum fashions in a decorous respectful history for herself and her children. She looks into the horizontal oval of the bathroom mirror and Syrian life looks back with modernity ranged across the shelf under with a collection of multi colored toothbrushes and the usual soap, shavers, milieu of homes anywhere in the ‘developed world. The bombs and machine gun fire provide a symphony from the devil. All the rooms have wall hangings. In the room Grandfather sits, the acquired and steadfastly defended ante-room off the Dining Room, he diagonally faces the world from behind the corner of a small square table around which are four chairs. It is strange initially to see him not in a comfortable chair but his chosen spot is too a symbol of the insecurity in everyone’s minds. Arranged along the wall facing towards the open arch to the Dining Room is a vast collection of Books arranged up to the ceiling. On the wall lithograph black and white pictures, prints possibly, illustrating the Syrian mind. One is of a pair squatting on the ground in an exterior as if they have stopped on a journey. Something of the Bedouin about it. They look at the centre and above it is and behind is a bird with other smaller birds in flight above. Another has a long mountainous valley with a dark side on one side and slightly lighter on the other as what appear to people walking away through this valley perhaps to an unknown place. There in a few prints you have fixed society, harmony and pressing on. A red rug is hung on another wall and around the Dining Room are family photographs carefully arranged in decorative frames on fine furniture. Then there is a centrepiece on which Oum in a scene displays a longing and almost listens to its pro memora for its advice. A moment which has similarity to a scene in the aforementioned Under the Shadow. The Dining table is a huge eight seater mahogany or walnut split highly polished table with all the matching seats. In prime position as a focal point of the held traditions Oum holds tight to, it is providing solace and assurance of identity, manifest in a continuity of history now in the throes of alteration which might be irretrievable. This is something everyone can relate to and is very cleverly used as a cinematic device of profound significance. In contrast to the interior so far described there comes the hallway decoration which lifts itself into the twentieth century uncompromisingly with on one wall a Warhol type red lithoprint of possibly Blueswoman Janis Joplin. A far more impactive design carefully chosen by the imaginative Phillipe Van Leeuw asserting his wide ranging skills is in the room where the family from above are given. It is a child’s bedroom given over to the young family. On its walls are a Dave Matthews Band Psychedelic band poster. Above the bed are arranged Small white discs like linking stars. Most imaginative, as we see when we look at a distraught Halima holding her cherished baby, are two space posters. On the left is a spacecraft launch looking like the USA, ballistic missile propelled Voyager, with alongside it a Russian equivalent. Hugely implying hope and unknown destiny and a race between nations for greater status and I think contextually it has a shocking convergence on screen, within the film, with the image collecting narratives and spilling them out for our digestion. A pretty remarkable but simply resonance for us and of the Directors overall intent. Only occasionally moments of terror and their pace seem wrong. When it is mentally rushing scenes occasionally lack the consistent pace and fall flat or flow in the wrong way. One which is fully on pace and very intense is the treatment of a core brutal act of violence which has the horror of mindless acts enter the flat itself. There is a climb towards a horrific attack inside the apartment which has a deeply impacting very brutal effect on the group. With the outside militants having the home in brutal fashion one young family member goes outside, as another had done in the beginning, to take on the courageous act which puts him in the same danger. He sees it as his duty and bravery is implicit through the whole ensemble facing down entrapment. For a young person this is testimony to him of the proximity of war and the need to survive. We see how all symbols of war, conscripted ancient allies have been corrupted unimaginably and it puts forward too the very present act of mans suppression of woman in search of power and control which these infidels see as a medusas head or a hydra of myths of Andromeda and the space allusion again used as an allegory which is a departure from God. Infidels, they are known in the Muslim faith as kaffirs have contested meaning. Both, according to my own beliefs, signify someone who lacks all and any faith Christian, Muslim or other. For faith is to have belief in the simple message of the Word a God the Messiah, a Prophet or messenger of religion found in acceptance to a higher dominion one no one has complete knowledge or control of. 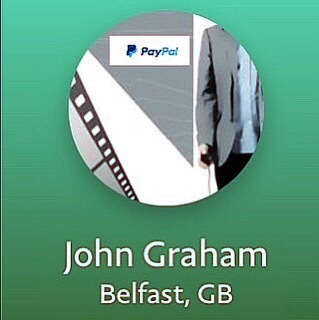 Fundamentally this places the infidel as someone who rejects all dominions of faith. It is not exclusive to one religion or another but is a part of the human flaws which religious beliefs seek to offset and overcome through faith. Using these terms as absolute is not adequate either. It seems Infidels themselves appropriate rejection and not inclusion as a belief to suit their own worldly means. To me an Infidel is a person who disbelieves or doubts a particular theory, belief, creed, and other extensions of the spiritual world and each belief form has within it detractors and ‘infidels’. This film puts across a faith in humanity despite the infidels war on people’s souls right outside and visits their home. Some religions have not found in their own faith enough to appeal to reconcile differences and project the ‘love thy neighbour’ credo. This is through perhaps division and separateness from a core simplicity. The Word if you like. There are no shortage of views on this fundamental disconnection with the intrinsic human core of goodness. One we see in its various forms in Insyriated. The distractions have been overwhelming across the millennia and this film places another fine contemporaneous view which is extremely explicit in its focus on the humanity trapped inside and by false projections brutalisng all humanity. Here are some other words I revisited lately. These words are recalled Well, God is in his heaven And we all want what’s his, But power and greed and corruptible seed Seem to be all what there is. Some might remember it is Bob Dylan’s Blind Willie McTell describing for me the void, absence of common sense and covers and crosses boundaries will remaining within the pain. The peril of the people is even more tragic. For some the title will appear uninformative and it is a strange choice especially as the European Director (Belgian) must have a handle on what is impactive. 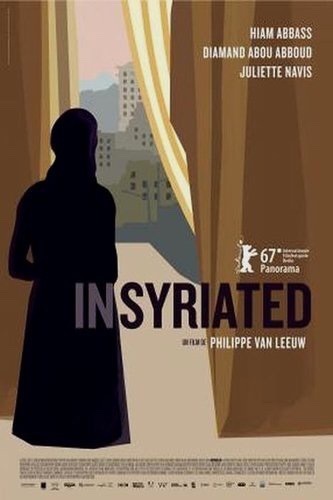 Insyriated is perhaps a Syrian translation ongoing and a portrayal of interventions uncalled for and unwelcome. More than unwelcome the are faced with a tyrannical regime and a counterinsurgency with multiple heads and aims. Captured in a domestic vice with war raging all around in one day we follow the outcomes as they change within seconds facing further and further brutalisation of their existence. The very connections with Bedoiun nomadic lives are kept fast as the film takes care and very vividly drawn us into its claustrophobic world which gathers and grows ever menacing and disturbing through events unfolding before our eyes. We are a the eyes of an observer who is in the direction almost within the rooms where the scenarios unfold. Each room tells a part of the story and the apartment is sizable enough for scenes and people to separate and be alone with their knowledge. Each of the children play a great part in seeing as we do things as they contrast with their world expectations. The hand held camera is a device which grips us and won’t let go of the escalating and worsening fate. As invisible characters our eyes are intimately gathering and making comparisons and judgements based on our own views. The nerves bristle and sudden changes impress on the viewer and force reactions which are in the moment as you place yourself inside it albeit avoiding the consequences in others harms way. There will be few films to match this dramatic gripping treatment of a conflict we know little of. Aleppo is another place and where another entirely different but genocidal War is being carried out while other detached twin warfares carry on in other cities and settled rural communities. Documentaries and heavily edited news reporting are often the only means of being witnesses to the wide arena of war zones. This film takes us away from the politics and culturally fights a battle for humanity with the brave and superb acting of people whose investment in the film is over and above anything you see on a regular basis. The actors have invested themselves in this and it is clearly something which they care for with passion. There is one scene where they retreat to the kitchen which is the ‘safest’ refuge on hearing explosions are close by. The camera remains still and the rooms atmosphere pours out in the movements and reactions of individuals as their movements shift in harmony and with individual anxiety. It is like looking into a Biblical painting as it is intensely absorbing. One of the occasions when they pause and wait and we watch flabbergasted, shocked and overcome along with them. Disbelieving and suppressing the truth of the reality happening everywhere. 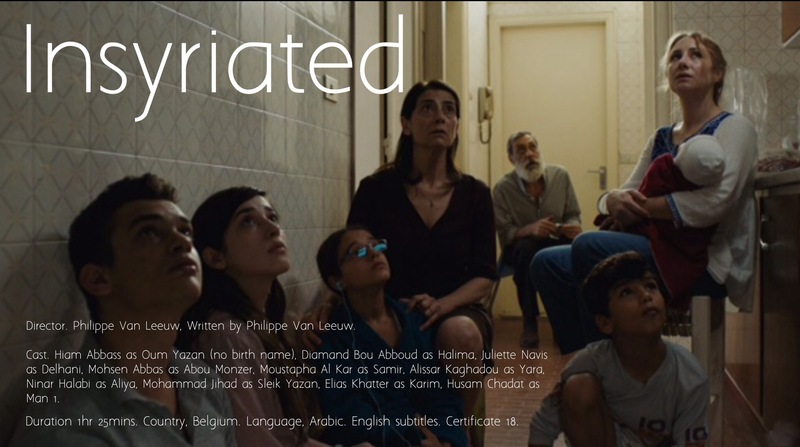 Insyriated will screen at QFT from 15th September 2017 until 21st September 2017.